Tonight on my way home from work I started thinking of what to have for dinner. I knew that I had some leftovers that I needed to use and a plan started to come together. I decided to make a Cottage Pie with some leftover seasoned hamburger from the Loose Meat Sandwich I made last night. The first task was to prepare the base or filling for the pie. 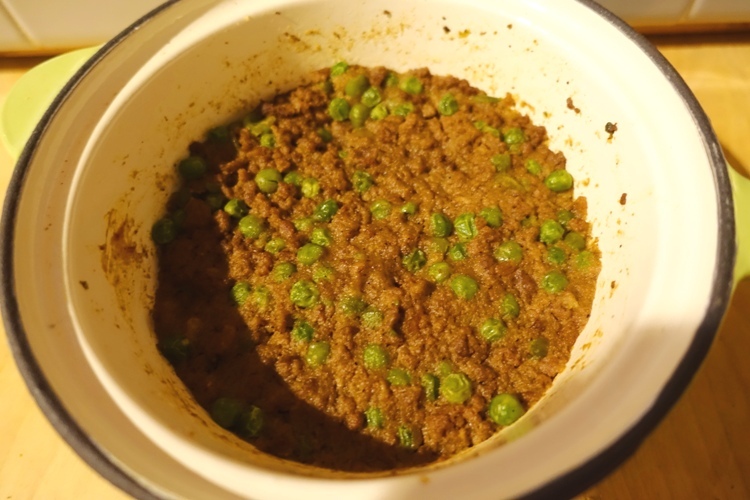 I will not give an exact recipe but I added some more seasoning to the leftover hamburger as well as some leftover peas that I had made for another dish earlier in the week. I then made a gravy using a secret thickener and some miso. After letting the filling simmer awhile to build flavor I stuck it in the cold box to let it firm up before baking. In the meantime I had made some mashed potatoes and let them cool also. I needed a nice dry mash so that it would not leak into the filling. 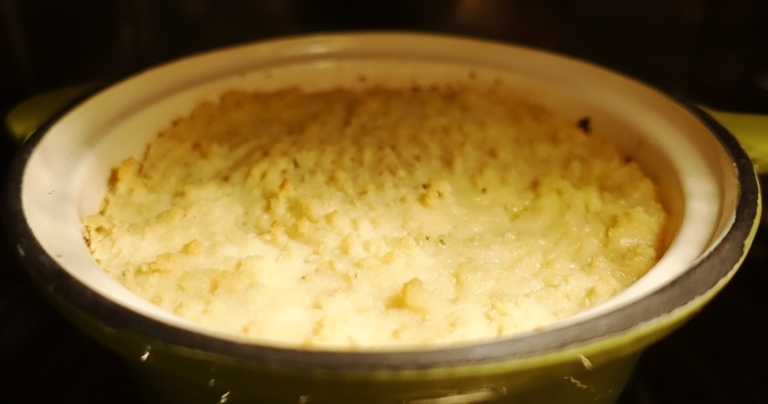 I was finally ready to spread the potatoes over the filling of the cottage pie while the convection oven heated up. 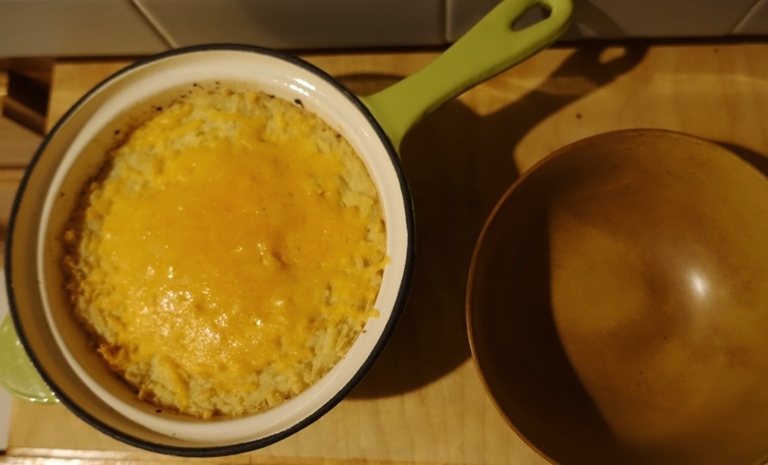 Here the cottage pie had been in the oven for most of the time that was needed and is ready for a cheese topping. Here is the finished cottage pie all ready to be dished up. It smelled really good and I was ready for some comfort food. While it was baking I had turned on the TV and found that the Rugby Sevens World Cup was on. I did not get a good picture here as steam was coming off of the dish and my camera would not focus properly. However you can see the nice contrast between the filling and the topping. 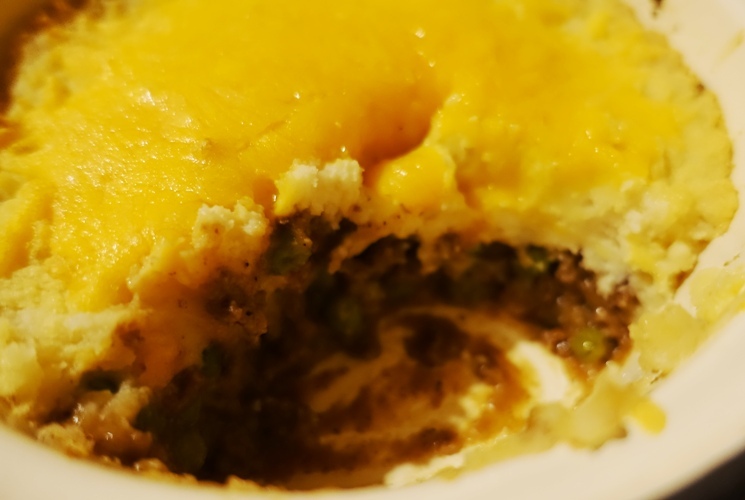 Now for a picture of the cottage pie in the bowl. It looked wonderful and was delicious. 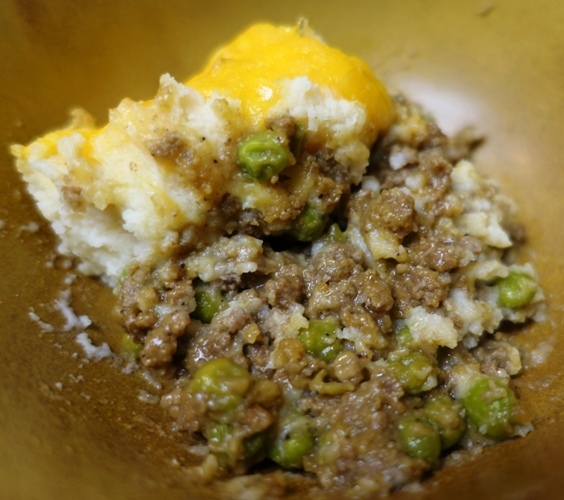 The hamburger or mince had a nice complex taste and the creaminess of the mashed potatoes was a nice contrast. The one thing I would do different is have a thinner layer of cheese and perhaps add it a bit earlier. Now I need to go for a long walk. 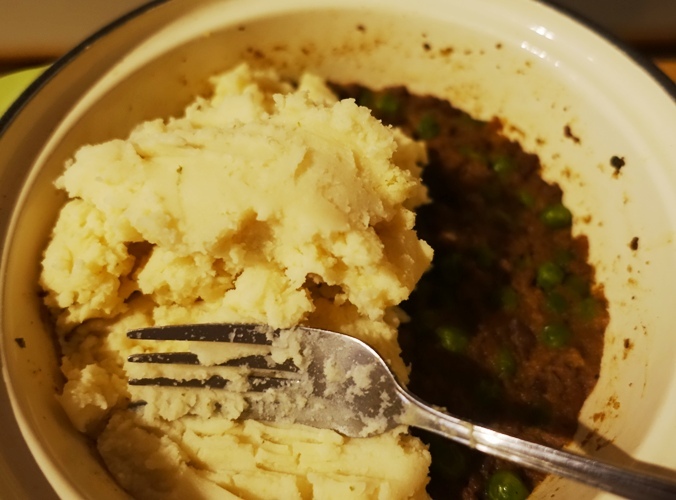 This entry was posted in Food, South Africa and tagged cheese, Comfort Food, Cooking, cottage pie, Hamburger, mashed potatoes, peas, recipe, rugby sevens. Bookmark the permalink.